Glacier recession driven by climate change produces glacial lakes, some of which are hazardous. 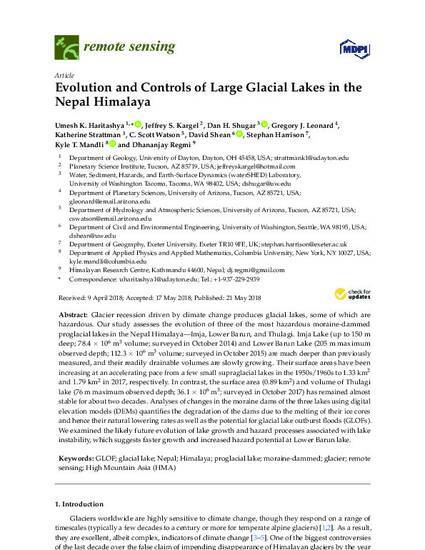 Our study assesses the evolution of three of the most hazardous moraine-dammed proglacial lakes in the Nepal Himalaya—Imja, Lower Barun, and Thulagi. Imja Lake (up to 150 m deep; 78.4 x 106 m3 volume; surveyed in October 2014) and Lower Barun Lake (205 m maximum observed depth; 112.3 x 106 m3 volume; surveyed in October 2015) are much deeper than previously measured, and their readily drainable volumes are slowly growing. Their surface areas have been increasing at an accelerating pace from a few small supraglacial lakes in the 1950s/1960s to 1.33 km2 and 1.79 km2 in 2017, respectively. In contrast, the surface area (0.89 km2) and volume of Thulagi lake (76 m maximum observed depth; 36.1 x 106 m3; surveyed in October 2017) has remained almost stable for about two decades. Analyses of changes in the moraine dams of the three lakes using digital elevation models (DEMs) quantifies the degradation of the dams due to the melting of their ice cores and hence their natural lowering rates as well as the potential for glacial lake outburst floods (GLOFs). We examined the likely future evolution of lake growth and hazard processes associated with lake instability, which suggests faster growth and increased hazard potential at Lower Barun lake.